For some reason, I had always associated New York with sneakers. I don’t know why, maybe I’d had a dream in which sneakers had featured prominently which was set in New York. In any case, I took that as a sign that I needed to replace my old blue pair while I was in the city, and have a reminder of my trip. I didn’t realise when I left what a role they would play. Before the events of September 11, I had been recording my impressions of the U.S and New York in fine detail, because it was my first trip to a city I had dreamed of visiting for years. This was a trip I had been looking forward to for a long time, not least because it was also confirmation of a new position with CA I had been anticipating for many months. I’d always thought I had a pretty good picture of New York; I’d watched Sesame Street since before I could remember; I knew about Central Park and the Empire State Building and the Statue of Liberty, and I knew the streets leaked steam (for a reason I’m yet to fully comprehend. I’m told it snows there sometimes.) I didn’t really know how big it was, so I set out on the Saturday (the 8th) to see as much as I could.I went with my nose, which took me to places I’d only heard about in songs or on TV: Pennysylvania Station, Madison Square Garden, 42nd Street, Times Square, The Rockerfeller Center, Radio City Music Hall, Central Park, 5th Avenue, Madison Avenue, FAO Schwartz (The Toy Shop), Chrysler Building, Empire State Building and Macy’s. That took 8 hours of Solid walking (and shopping). From the top of the Empire State Building, I had my first real inkling of a) how huge the city is, and b) how stupid I was to have thought I could’ve covered it in a day. 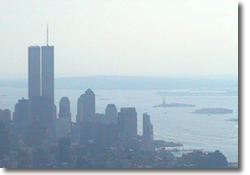 The Statue of Liberty was a small speck in the bay, and the twin towers of the World Trade Center kept watch over her. I remember thinking to myself that they looked like a pair of her bodyguards. I also had to keep shutting out the nagging images from the final syrupy scenes of Sleepless In Seattle, lest I be driven to fling myself from the mesh fences in anguish. I wound up at a busy Foot Locker store and carefully chose my pair (some grey and gold ‘New Balance’ joggers), and caught my train back to Islandia (a 1.5 hour trip). Waking up all ‘walked-out’ on Sunday morning, I resolved that having seen Uptown New York, Downtown could wait until next time. I was working for a New York company, after all, and there was work to be done today. I’d stay back at the hotel, I said, and leave the rest of the sightseeing for another day. I went to try on my new sneakers for breakfast: they were both for the same foot (right) and different sizes. Do I take them back? It’s a fair trip back to the city, and I will be returning eventually,… but I’m certainly not going to be transporting odd sneakers around the world. Nothing for it; I’ll need to return them. Back on the train; back into Manhattan. Having covered Uptown, I thought I’d kill off the remaining items on the check list, including the Big One; seeing the Statue Of Liberty. Having returned (and donned) the new sneakers, I proceded to experience the rest of New York, rather than put it off to the next trip. I boarded the subway for the piers, and walked along the waterline to the Staten Island Ferry. (The concierge had said that there were only two free things in NY; the muggings and the Staten Island Ferry). We floated by Libby and I waved, and admired the New York Skyline from a distance. I breathed deeply. I was *finally here*.There was only one more thing on the checklist. I planned a circuitous route up the caverns of Wall Street and alongside Trinity Church, stood right at the foot of the World Trade Center, and looked up. I never realised a building could be so high, and so simple (The Empire State Building has a lot of frills on the way up. This was a single block; like something out of science fiction). I visited the malls and coffee shops, which were still trading happily in the middle of Sunday afternoon. The Warner Brothers store was packed to the rafters with Harry Potter merchandise. I noticed that there were a lot of advertisements on the walls and billboards for job-seeking websites and services. I couldn’t find a Starbucks. I noticed the signs to the observation decks, and considered the climb. I had visited the Empire State Building less than 24 hours earlier, and I didn’t think you’d see too much different from up there, even if it was even more brilliant and clear today. I decided that I would have to have a look next time I was in New York, and boarded the train back home from the WTC train station. A day or so later, we all learned that the buildings had been reduced to rubble. I count myself so lucky to have seen the ‘old’ New York skyline as I had pictured it all these years. Were it not for the half-assed job of someone in a New York shoe store, I might have missed out on a spectacle I’d always have the chance to see. It wasn’t until a few days later that I realised that I’d probably forseen (or been forshown) the importance of buying a pair of shoes at that time in that place.I know it’s odd to be talking about something as insignificant as shoe purchases in such a time of tragedy, but it gives me some heart to know that Someone still seems to have a hand on the wheel, even though it looks out of control. I have learnt new vocabulary: from the land which brought us t-rex and t-bird, comes: t-storm (thunder storm). And apparently, every traffic delay must have a corresponding ‘rubbernecking’ delay in the opposite direction: when people slow down for a look-see. We get it in Australia, but we just haven’t had to invent a word for it. I’ve figured out why I think American coffee (particularly Starbucks) smells so different to coffee from anywhere else in the civilised word: it’s got *vanilla* in it, I reckon. I’ve only ever seen snow once in my life, so it’s a bit weird to have lifestyle shows stressing the importance of storing household chemicals and cleaners in the backyard shed so that the don’t get ruined when they *freeze*. I didn’t have to swat a single bug. Whoever has the market in yellow paint in NY is onto a good thing; almost any vehicle which does something important is yellow. There was a pair of underpants floating in the NY Harbour just off the Statue of Liberty. No comment. The statue of Liberty has 7 points on its crown. ‘Bob The Builder’ is dubbed with American voices for the US market, which makes Bob sound like a stockbroker. Here’s an real, genuine ad from an actual NY train (to prove I’m not making this up). It says: “New York Central (a TV show, presumably) lets me focus on celebrities and ignore my personal problems altogether.” Yikes.